Today an incident was described to me — I was not there to see it. A walker was coming down a path next to a wooded area with his fairly small unleashed dog. Until today, the dog had never noticed any coyotes so there has never been a problem: the dog always went about minding his own business, and the owner was free to take in the scenery and wildlife. But today, out of the wooded area appeared a coyote which ran after the dog. Coyotes have only chased dogs that have intruded upon them, so inadvertently this dog and walker may have come too close to the coyote — they may have startled the coyote. This startle and pursuit behavior has happened various times in the past with other dogs. The owner was quite upset that the coyote hadn’t just fled away from them. Instead, the coyote chased the dog right back to its owner and the owner had to scare the coyote off. The owner felt that this particular coyote was displaying a new boldness in doing so. We discussed things that might have been going on. First, had the dog been leashed, the incident could have been halted before getting going: an owner’s close proximity to a leashed dog along with scaring the coyote off, by yelling, could easily have kept the coyote away. The coyote’s initial response to the startle might have been to stand up to the dog and give it a clear message: “leave me alone, go away.” However, once the dog ran off in fleeing mode, the coyote’s natural reaction was to pursue it. The dog, then, of course, came back to its owner with the coyote on its tail, fairly oblivious to the owner standing there. The owner felt this behavior showed a new boldness in the coyote. At this point he was able to interrupt the chasing behavior and scare the coyote off. However, the incident left him feeling uneasy: he will have to be more vigilant now. Coyotes which have been startled in this manner tend to react this way — I have seen it often: it is another reason to keep dogs leashed as a precaution to insure safety for both dogs and coyotes. Another possibility to keep in mind is that running after the fleeing dog may also have been a “play” response. This particular coyote is one who has always loved playing chase with his sibling until pretty recently when the sibling — dominant sibling — decided that bullying was more fun than chasing games. The invitations to play are no longer responded to positively by the dominant sibling. “Playing” was pointed out to me as a highly likely explanation for the short chase because it fits in so well with the individual character of this particular coyote. Ultimately, we won’t know — but restraining our pets with leashes is a good idea in coyote territory. The coyote involved in the incident is one of two young 20-month olds. It might be of interest that that these are young males who are now dealing with their own maleness and testosterone and coming of age. At this time of year last year the one male pup from a previous litter — at the time also a 20-month old — left for good. This is dispersion time, when young coyotes go off on their own to seek their own fortunes and fates elsewhere — it’s time for them to leave the nest. Already the sibling rivalry between the two siblings keeps them much more distant from each other than they ever have been in the past. The coyote situation is a constantly evolving one. 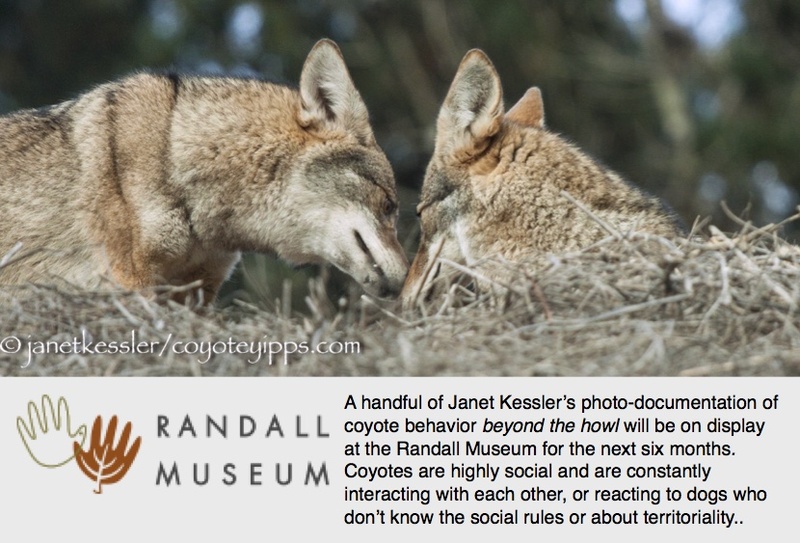 But not all coyotes do move on: sometimes some remain as part of the original family pack. I’m watching to see how things develop. I don’t know if this might be relevant to the incident or not, but it is information to bear mind, especially about young coyote males.